From its humble beginning in the early 1980s, Hawk Mountain’s internship program has grown into a fully-fledged graduate-student level Traineeship, which, over the years, has offered academically rigorous training to more than 380 students in 75 countries on six continents. The proof of success they say is “in the pudding,” and as I sit in the Johannesburg Airport in South Africa this evening pouring over VULTURE NEWS–the official publication of the International Conservation Union for Nature’s Vulture Study Group–I am reminded of just how far and wide our training efforts have taken root. Volume 67, the current issue of VULTURE NEWS, has two main articles, four short communications, and several reports that run for a total of 80 pages. Both main articles in Volume 67 were co-authored by former Sanctuary trainees, two from Kenya, and one each from Nepal and New York. And as if that were not enough, one of the four Short Communications in Volume 67 was coauthored by three Sanctuary Research Associates and me. The first major article, Assessment of the occurrence and threats to Hooded Vultures in western Kenyan towns, was coauthored by former Sanctuary trainees Martin Odino– now of the Raptor Working Group of Nature Kenya–and Titus Imbomba–now of the National Museums of Kenya– and conservation colleague Darcy Ogada. The paper confirms significant recent declines in the currently globally endangered Hooded Vulture in western Kenya, where large numbers of “hoodies” once foraged in local slaughterhouses and city dumps. This species is the object of my current efforts here in South Africa, and although there was little evidence of exploitation of the birds for witchcraft in Kenya–something that is common in other parts of Africa–the introduction of modern closed-system (i.e., sanitary) slaughterhouses and the widespread and increasingly popular poisoning of stray dogs is thought to have contributed to the declines, which appear to have been underway for about 15 years. 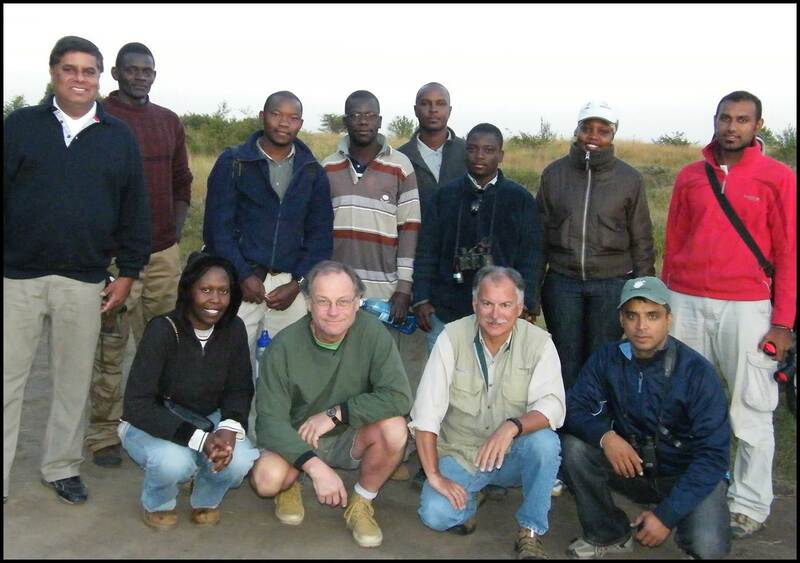 Martin Odino stands second from left in a “trainee class” photo taken in Kenya in 2009. The authors surveyed elders in eight towns, and although attitudes there are largely neutral, little in the way of local protection is underway. The authors call for a vulture awareness campaign to help and possibly reverse the declines. This this is exactly what needs to be done and the Sanctuary hopes to help. 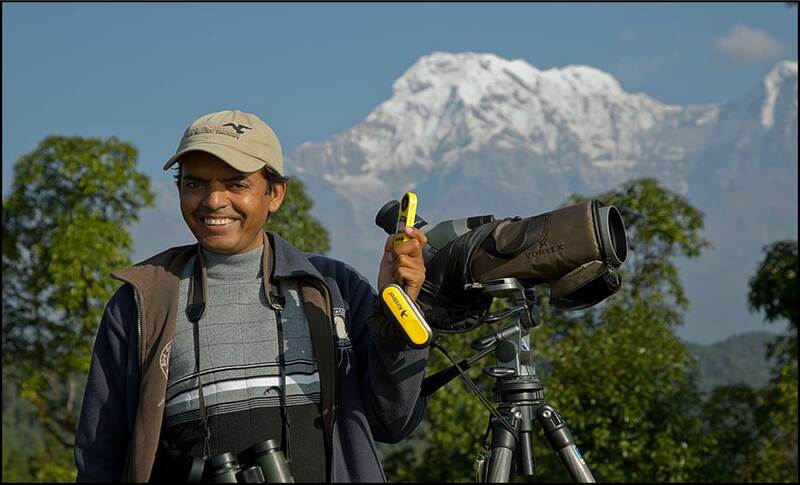 The second main article in the NEWS, Population and breeding success of Red-headed Vultures and Egyptian Vulutres in central west Nepal was coauthor by former Sanctuary trainees Tulsi Subedi (see photo below), now of Himalayan Nature, and Robert DeCandido of New York City. Although both species of vultures currently are doing fine in Nepal, both are in catastrophic decline in other parts of their ranges. In India, for example, declines in Red-headed Vultures are estimated to be at 44% annually and those of Egyptian Vultures at 35% annually. The veterinary drug diclofenac has been implicated in the precipitous population falloffs. Subedi and DeCandido’s monitoring efforts offer baseline data for a continuing monitoring effort. The short communication, Avian Scavengers, but not conspecifics, feeding on the carcasses of storm-killed Turkey Vultures on the Falkland Islands was coauthored by me and Sanctuary research associates Micky Reeves of Falklands Conservation, Melissa Bobowski of Michigan, and Anna Autilio of Boise State University. The piece reports on winter-time observations of opportunistic scavengers including Variable Hawks and Striated Caracaras feeding on the carcasses of two storm-killed Turkey Vultures. The author (upper right) with Sanctuary research associates Micky Reeves (upper left), Marc Bechard (lower left), and Melissa Bobowski. Although flown over regularly by at least six other Turkey Vultures from a nearby roost, the carcasses were not fed upon by these conspecifics. This intriguing natural-history note describes an honor of sorts among this, the world’s most common and widespread obligate avian scavenger. The article, which represents the 250th Sanctuary contribution to conservation science since 1992, is, in fact, the tiny tip of a very large “iceberg of information” contributed by the Sanctuary and its colleagues across the years. It also suggests that the training of young conservationists at Hawk Mountain is having its intended effect. 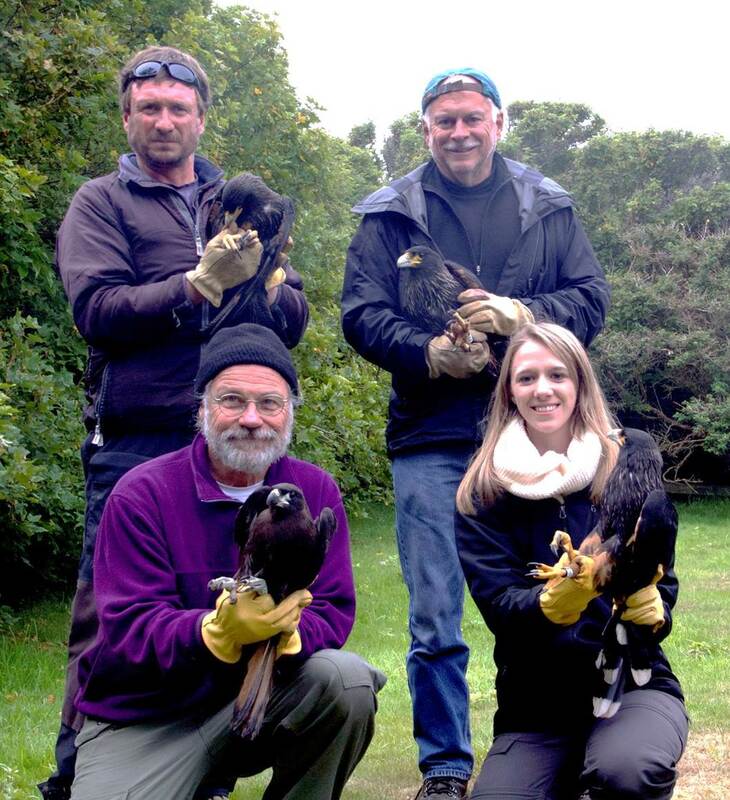 Next month I will accompany former trainee Anna Autilio to The Falkland Islands as she continues her studies of the feeding and social behavior of the globally near-threatened Striated Caracara. Stay tuned for update on this exciting project.